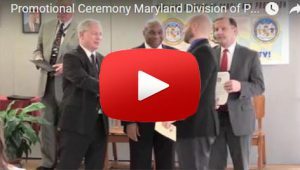 TOWSON, MD — Twelve Parole and Probation agents were officially promoted today to the rank of Field Supervisor I at a special ceremony at the Public Safety Education and Training Center in Sykesville. The new supervisors will oversee agents in field offices all across Maryland. Secretary Stephen Moyer, Deputy Secretary J. Michael Zeigler, and Parole and Probation’s Acting Director Joseph Clocker all addressed the group with encouraging messages. Ron Wilson, a 46-year veteran of Parole and Probation who was the very first Manager of the Year ever honored by the Department of Public Safety and Correctional Services, was the special guest speaker. Public Safety salutes these new Parole and Probation leaders!